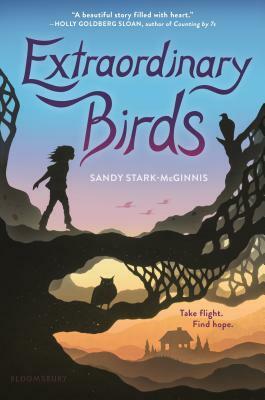 Sandy Stark-McGinnis' debut middle grade novel filled my heart with love and made me feel like I have wings. December, along with wonderful supporting characters Eleanor and Cheryllynn, have strong voices and their stories will stay with you long after you close the book. Stark-McGinnis handles challenging topics with a light touch and beautiful empathy. I loved this book. My heart broke for December a million times during this breathtaking novel We have all yearned to fly in our lives, but her quest and belief that she is truly a bird is so beautifully portrayed. Finding Eleanor after so many disappointing homes and watching how they slowly bond, was so beautiful The care and rehabilitation of Henrietta symbolized December's healing as she helped the bird to heal and fly again. Cheryllynn is a a perfect foil for December and a great heroine for young and old readers. Adored this story and learned so much about birds during this joyful read. My heart soared when December ate Eleanor's soup!